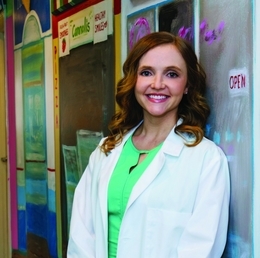 Kailey A. Housley, D.D.S., may be a board-certified pediatric dentist, but she also considers herself a teacher, of sorts. When parents bring their children to see “Dr. Kailey” at the Warrington office of Children’s Dental Health, the dental operatory becomes something of a makeshift classroom. She’s careful to spend ample time informing patients and parents about issues that might affect a child’s dental health— everything from proper brushing techniques to the importance of good nutrition to thumb sucking and other habits that can impact a child’s oral and dental development. Teaching comes naturally to Dr. Kailey. She has had a lifelong love of education stemming back to days spent in her mother’s elementary school classroom, watching her mother teach. At Children’s Dental Health, Dr. Kailey handles everything from routine checkups and cleanings to metal-free fillings and dental extractions. At age 28, Dr. Kailey says people often tell her she looks even younger than her years. Her patients seem to respond to her fresh-faced appearance, too, which she says helps her develop a strong rapport with even the shyest patients. As a result, taking a seat in the dentist’s chair—regarded by some children as a dreaded chore— becomes a pleasant experience. Dr. Kailey earned her dental degree from the University of the Pacific Arthur A. Dugoni School of Dentistry in San Francisco. In July 2016, after completing her pediatric residency in Buffalo, she joined Children’s Dental Health. She received her board certification from the American Board of Pediatric Dentistry in 2017. Children’s Dental Health has 20 offices throughout the Greater Philadelphia Area, from West Philadelphia to Harrisburg to a newly opened location in Easton. Each location boasts a playful and inviting décor designed to put young patients at ease. In Warrington, for example, the office sports a bright and colorful “beach pier theme,” as Dr. Kailey calls it—murals of the boardwalk, sandy dunes and seascapes featuring dolphins, sea turtles and other ocean critters; a “surf shack” in the waiting area with interactive games to entertain children prior to their appointments; and other whimsical elements that share in the beach-pier theme. The Warrington office represents a relatively new addition to the Children’s Dental Health “family,” though the practice inherited many of its patients—not to mention several key staff members—from a retiring pediatric dentist whose established practice was purchased by Children’s Dental Health. As for the office’s primary dentist, Dr. Kailey, she has become a welcome addition to the community, according to Kelly Raible, Children’s Dental Health’s director of marketing. A newly redesigned website, ChildrensDentalHealth.com, is one example of this initiative. The interactive site gives existing patients the capability to request appointments, submit questions and pay their invoices online, while new patients can request a tour of the office location of their choice, all from their smartphones. In addition, Children’s Dental Health accommodates for dental emergencies and, whenever possible, same-day appointments. If parents do decide to take their child to a Children’s Dental Health office, Dr. Kailey says they will quickly gain confidence in their decision. For more information on Children’s Dental Health or to request an appointment, call (610) 624-1090 or visit ChildrensDentalHealth.com.